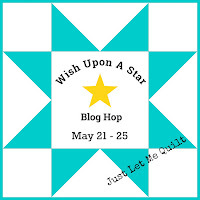 Heads up - another awesome blog hop starts today, with plenty of eye candy to see! I've teased you with my Hunter's Star blocks, with the full reveal on Friday, May 25. Until then, there a ton of bloggers participating, and we should be super excited to see what they've created! With nine bloggers each day - that's a lot of quilts to see! Enjoy the hop and come back Wednesday for Midweek Makers, and of course, Friday, for my Hunter's Star reveal.